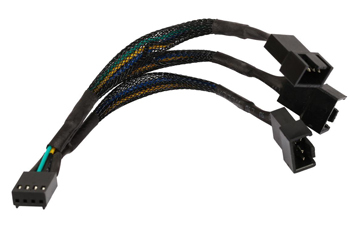 The Coboc TX4SPL3-6 TX4 PWM multi-fan splitter cable gives you an easy, cost-effective way to connect three computer case fans to a single motherboard fan header. It features one TX4 4-pin female connector at one end for connection to your motherboard, and offers three TX4 4-pin male connectors* at the other end, which allows for easy connection to three PWM fans at the same time. 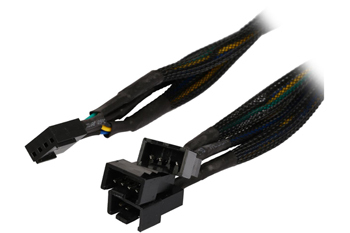 The splitter cable can even send the RPM signal to the motherboard for synchronizing the fan speeds. Only one of the three fans sends its tach signal (the one with full 4-pin connector) to report its RPM, but the others will still follow the PWM signal. Two of the three male connectors are missing the pins of tachometric signal, ensuring your fan speed monitor won't bounce all over the place from getting three sense signals. You motherboard can always get an accurate RPM signal. The sleeved design enhances cable management, while the black enclosure provides a sleeker look that seamlessly integrates into the case's interior. *The TX4 4-pin male connectors are compatible with both 4-pin PMW fan connector and 3-pin fan connector. 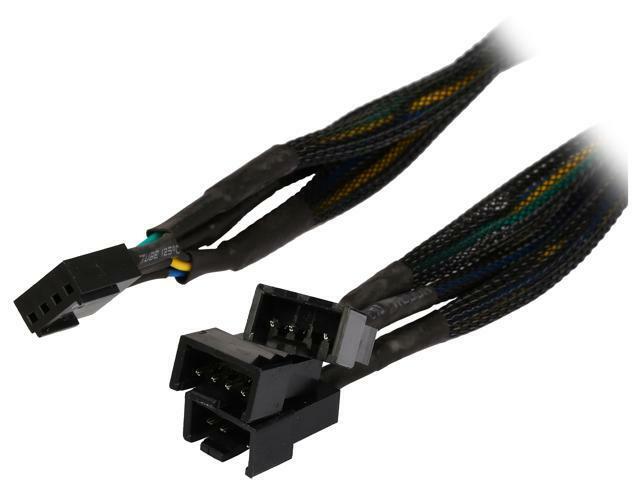 This TX4 4-pin multi-fan splitter cable connects to your motherboard and controls three PWM fans. Two of three male connectors are missing the pins of tachometric signal,ensure your fan speed monitor won't bounce all over the place from getting three sense signals.Guarantee motherboard getting an accurate RPM signal. Only one of the three fans sends its tach signal (the one with full 4-pin connector) reports its RPM, but the others will still follow the PWM signal. Cons: The sleeving on the cables could have been fit a bit better. Other Thoughts: I had previously written a review on this product saying it did not work but that was of my own error. Turns out I had plugged the fans I wanted to use with this in wrong, luckily I didn't fry my motherboard but at least I can come back and say this product rocks and does its job well! So if it does not work for you I would double check your connections to make sure everything is where it should be! Pros: Kayla from Newegg was extremely helpful in issuing a refund so i can buy another set. -Disclaimer this review is not really for the product itself. Just voicing out my thoughts about the shipment. Cons: Package did not arrive, courier had audacity to mark package as delivered when I have my security camera recording every second. No package received. I understand this is not big money order but the inconvenience is such a hassle. Other Thoughts: I recommend Kayla for investigating the shipment of the package. Other Thoughts: I purchased these as extension because of the amount of fans I have in my build. They do exactly what they are supposed to do. They allow me to connect all of my fans to my motherboard which is what I needed them to do. Pros: The connectors do what they are supposed to do. The LED fans seem to work fine with this too. The product was in a really good condition when it came. The delivery was also pretty fast ! Cons: I actually thought that was an 4-pin to 3-pin... Even tho I can still plug my 3 pins fans, I can only plug them to two pins male because, for some reasons, the third one is at the other side of the connector... So I guess you’ll need a 4-pins thing for this one to have 3 pins. Other Thoughts: However, one of the males has 4 pins... Even if I don’t care, I wonder why. Pros: Appears to be made made OK.
Cons: This is really not a 4-Pin to 4-pin splitter as you might think by the description. It is a 4 pin female that splits into two 2-pin males, and one 4-pin male. The description of the item led me to believe that I would be getting one 4-pin female that splits into three 4-pin males. Pros: Sleeved, and has 3 rather than 2 connectors, which lets you turn a single 4 pin into enough to fill out many cases with all the fans that they can support. Cons: connections near the terminals are ugly, but small enough to overlook.